This article is about the dynasty that ruled Myanmar between the 16th and 18th centuries. For the Toungoo period (တောင်ငူ ခေတ်), as used in traditional Burmese historiography, see First Toungoo Empire. 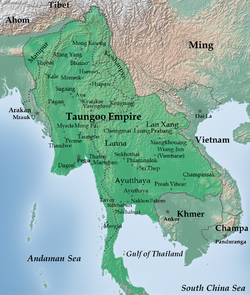 The Toungoo dynasty (Burmese: တောင်ငူမင်းဆက်, [tàʊɴŋù mɪ́ɴ zɛʔ]; also spelt Taungoo dynasty) was the ruling dynasty of Burma (Myanmar) from the mid-16th century to 1752. Its early kings Tabinshwehti and Bayinnaung succeeded in reunifying the territories of the Pagan Kingdom for the first time since 1287 and in incorporating the Shan States for the first time. At its peak, the First Toungoo Empire also included Manipur, Chinese Shan States, Siam and Lan Xang. But the largest empire in the history of Southeast Asia collapsed in the 18 years following Bayinnaung's death in 1581. The dynasty quickly regrouped under the leadership of Nyaungyan Min and his son, Anaukpetlun, who succeeded in restoring a smaller, more manageable kingdom, encompassing Lower Burma, Upper Burma, Shan States and Lan Na by 1622. The Restored Toungoo kings, now based in Ava (Inwa), created a legal and political system whose basic features would continue under the Konbaung dynasty well into the 19th century. The crown completely replaced the hereditary chieftainships with appointed governorships in the entire Irrawaddy valley and greatly reduced the hereditary rights of Shan chiefs. Its trade and secular administrative reforms built a prosperous economy for more than 80 years. The kingdom entered a gradual decline due to the "palace rule" of its kings. Starting from the 1720s, the kingdom was beset with pesky raids by the Meitei people of the Chindwin River and a nagging rebellion in Chiang Mai. Raids by the Meitei intensified in the 1730s, reaching increasingly deeper parts of central Burma. In 1740, the Mon people in Lower Burma began a rebellion, founding the Restored Hanthawaddy Kingdom. The Hanthawaddy armies captured Inwa in 1752 and ended the 266-year-old Toungoo dynasty. King Mingyi Nyo founded the First Taungoo Dynasty (1485–1599) at Taungoo far up the Sittaung River south of Inwa towards the end of the Ava Kingdom in 1510. After the conquest of Inwa by the Shan people in 1527, many Bamars migrated to Taungoo, which became a new centre. Mingyi Nyo's son, King Tabinshwehti, unified most of Burma, consolidating his power and pushing southward, over-running the Irrawaddy Delta and crushing the Hanthawaddy capital of Bago. In 1544, Tabinshwehti was crowned as king of all Burma at the ancient capital of Bagan. By this time, the geopolitical situation in Southeast Asia had changed dramatically. The Shan gained power in a new kingdom in the north, the Ayutthaya Kingdom had established itself as a suzerain power around the Chao Praya river basin, while the Portuguese Empire had arrived in the south and conquered Malacca. With the coming of European traders, Burma was once again an important trading centre, and Tabinshwehti moved his capital to Bago due to its strategic position for commerce. He then began assembling an army for an attack on coastal Rakhine State to the west. Tabinshwehti's forces were defeated at Arakan but he was able to gain control of Lower Burma up to Pyay. He led his retreating army eastward to the Ayutthaya Kingdom, where he was again defeated in the Burmese–Siamese War (1547–49). A period of unrest and rebellions among other conquered peoples followed and Tabinshwehti was assassinated in 1550. Tabinshwehti's brother-in-law, Bayinnaung, succeeded to the throne in 1550 and reigned 30 years, launching a campaign of conquest invading several states, including Manipur (1560) and Ayutthaya (1564). An energetic leader and effective military commander, he made Toungoo the most powerful state in Southeast Asia and extended his borders from Laos to Ayutthaya. Bayinnaung was poised to deliver a final, decisive assault on the kingdom of Arakan when he died in 1581. His son Nanda Bayin and his successors were forced to quell rebellions in other parts of the kingdom, and the victory over Arakan was never achieved. The restored Taungoo or Nyaungyan Dynasty c. 1650. 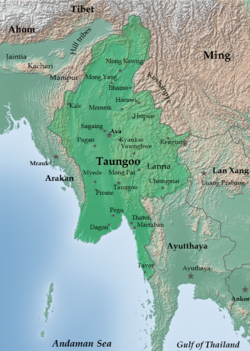 Faced with rebellion by several cities and renewed Portuguese incursions, the Toungoo rulers withdrew from southern Burma and founded a second dynasty at Ava, the Nyaungyan or Restored Taungoo Dynasty (1597–1752). Bayinnaung's grandson, Anaukpetlun (1605–1628), once again reunited Burma in 1613 and decisively defeated Portuguese attempts to take over Burma. Anaukpetlun's successor Thalun (1629–1648) rebuilt the war torn country. Based on Thalun's revenue inquest in 1635, the Irrawaddy valley's population was estimated to be around 2 million. The dynasty survived for another century and a half until the death of Mahadammayaza in 1752. Encouraged by the French in India, Bago finally rebelled against Inwa, further weakening the state, which fell in 1752. ^ Dr. Than Tun (December 1968). "Administration Under King Thalun". Journal of Burma Research Society. 51, Part 2: 173–188. Victor B. Lieberman, "Burmese Administrative Cycles: Anarchy and Conquest, c. 1580–1760", Princeton University Press, 1984.